A large pair of plaster lamps. 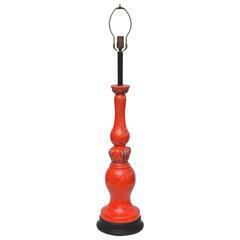 The lamps have deeply carved relief elements on all sides, and all sides are different. 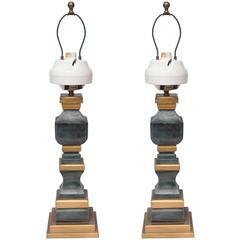 A pair of monumental lamps by Rougier. Brass hardware and opalescent Lucite elements. A very large lamp by Marbro. Murano art glass pineapple by Seguso. 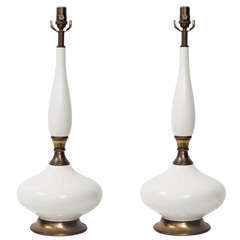 A pair of striking lamps. Black enameled wood with ceramic elements. New wiring. 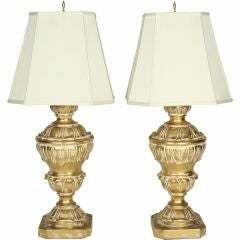 A rare pair of lamps by Trimble. Intriguing, beautiful and hunting design. These lamps are numbered, # 23 and #24. On/off switch is also a dimer. 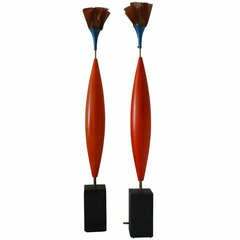 1960s pair of Asian plaster lamps. These wonderful lamps in plaster display a modern abstract texture. Vintage silk shades shown are included. Gorgeous oversized wooden table lamps.